Coming together for the greater good – everyone can help save a life. 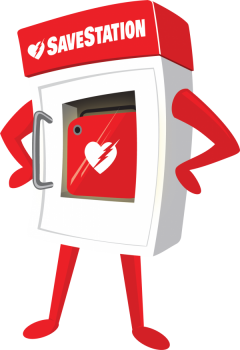 SaveStation is a line of AED cabinets that provide consistent, recognizable housing for all AEDs. These advanced cabinets are enabling access to AEDs both indoors and outdoors throughout our communities. 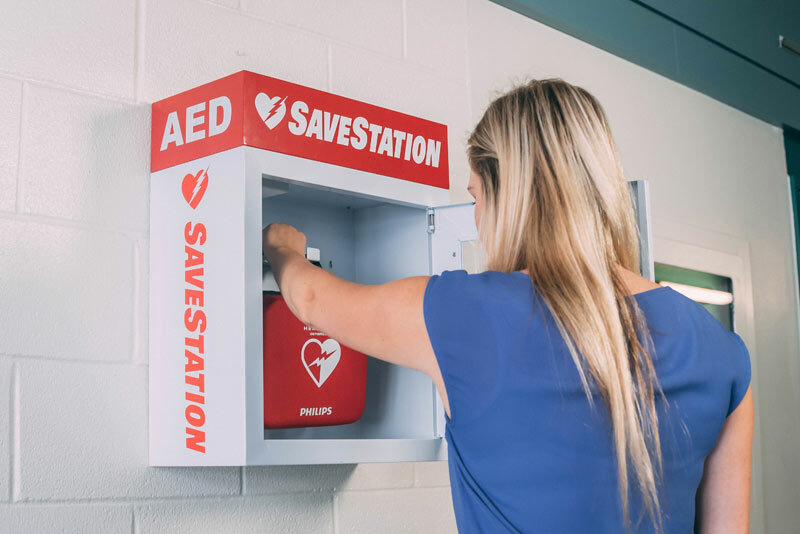 SaveStation is designed to help all Canadians quickly identify where a defibrillator is in an emergency and to access its easy-to-use life-saving AED. If you already have an AED at your work or within your community, that’s AWESOME! It’s super easy to re-brand your existing AED cabinet or wall bracket with an easy-to-identify SaveStation. Plus, every SaveStation comes with a very powerful video series that is designed to educate and empower everyone with the basic tools to save a life. Why do we need SaveStation? Sudden Cardiac Arrests happen in Canada on average every 13 minutes and kills more people than traffic accidents, gun violence, house fires, breast cancer, prostate cancer and aids combined! There is over a 75% survival rate when an AED is used within the first 10 minutes on a cardiac arrest victim. SaveStations help to standardize awareness and provide quick access to AEDs in highly accessible locations across our communities. The distinctive SaveStations are placed by business and community leaders who truly give back in a unique way, providing accessibility to easy-to-use, life-saving technology for everyone. There are also sponsorship opportunities to sponsor a SaveStation in your community and in return are provided with advertisement space on the cabinet. Get a SaveStation for your neighourhood.